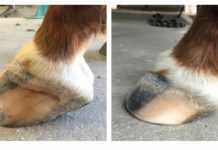 The Easyboot Trail continues to impress natural hoof care practitioners. 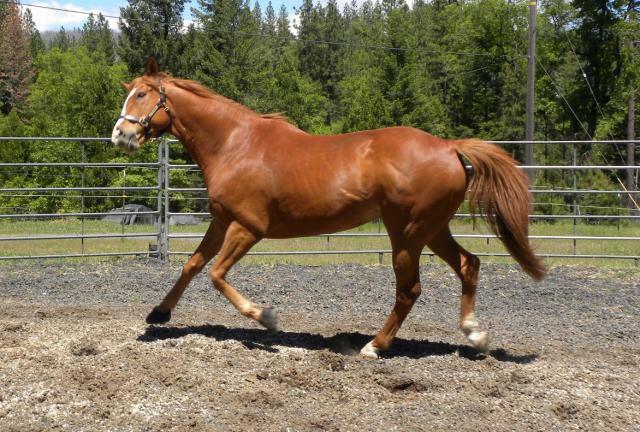 Sally Hugg of Oroville, CA, dropped me this quick note and shared some nice shots of her rescue horse, Easy. “Hi Debbie! I wanted to tell how much I like the new Easyboot Trail hoof boots. What a wonderful product! I bought them to use as a turnout boot on our big TB gelding, Slow N Easy. Easy is a racetrack rescue with bone loss in both front coffin bones due to years of pounding on the track. His feet have come a long way in the year since he was rescued, but they need protection. 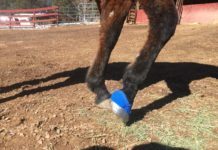 I needed a hoof boot that was breathable and would stay on during his pasture romps with our other horses. Easy is 1,300 lbs of pure race horse power and those guys really play hard, so it had to stay on and not rub. The first time I turned Easy out in his Trails I held my breath and watched as he flew around the pasture. Running and bucking uphill and downhill, not a single mishap and the boots stayed on. They have continued to perform flawlessly. Thank you Sally for your feedback. Sally Hugg is a natural hoof care practitioner, founder of California Trace mineral supplement and founding member and mentor of the Pacific Hoof Care Practitioners. 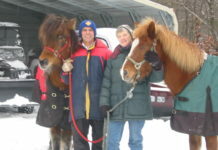 Sally also gives clinics around the country educating horse owners on equine nutrition. Next articleWhat Does BPA-Free Mean?